Dr. Manuel Arroyo is an international arbitration expert and partner at Nater Dallafior (Zurich), which is one of Switzerland's leading dispute resolution firms. He is a full-time arbitration practitioner and has acted in some 100 international commercial arbitrations as counsel or arbitrator. His areas of specialization include oil and gas, pharmaceuticals, sales, transport, infrastructure, construction, engineering, agency, distribution and franchising. In addition to editing this treatise, Dr. Arroyo has authored over 180 pages of legal commentary. Arbitration in Switzerland is the most comprehensive treatise on arbitration in Switzerland. Switzerland has become one of the most popular venues for international arbitrations in the course of the past century. In light of the country’s leading role, an all-encompassing publication on the country’s arbitration law is essential. 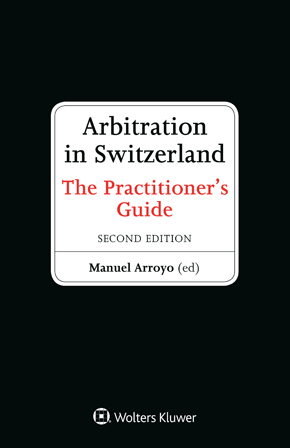 This incomparable second edition provides an in-depth analysis of the law and practice of international arbitration in Switzerland. With this second edition, which at nearly 3,000 pages is almost double the size of the first one, the publication has been divided into two volumes: the first volume focusing on Chapter 12 of the Private International Law of Switzerland (PILS) and the Swiss Rules of International Arbitration; the second volume on the ICC Rules, the CAS Rules and the WIPO Rules. These five article-by-article commentaries constitute the bulk of the treatise. This edition includes new chapters on arbitrating M&A disputes, labor disputes, energy disputes, commodity trading and shipping disputes, as well as an entirely new 400-page commentary on the 2014 WIPO Arbitration Rules, including the expedited rules. The commentary on the ICC Rules has been overhauled to cover the changes that were introduced on 1 March 2017, including the introduction of an expedited procedure for small claims, as well as general amendments designed to streamline non-expedited cases and to provide greater transparency to the arbitration process. The other three article-by-article commentaries on the lex arbitri (Chapter 12 PILS), the Swiss Rules and the CAS Rules have been fully updated and expanded, too. New special topics address res judicata, insolvency, default proceedings, bribery and corruption, and third party funding. This book draws on Switzerland’s large body of case law on arbitration, which substantially enhances reliability and predictability for parties from abroad. Whether a dispute involves intellectual property, construction, trusts, sports, investment or any of the other problem areas where arbitration promises the best resolution, arbitrators, counsel and the parties they represent will find all the information and guidance they need here. As Switzerland continues to follow developments in international arbitration and takes the needs of arbitration users into consideration, this practical and forward-looking book undoubtedly serves as an indispensable tool for practitioners in an environment of increased competition.